ESO Supernova Exhibition — Can we listen to the Universe? Can we listen to the Universe? Long radio waves carry very little energy. To detect them you need large dishes – often working in unison – and sensitive receivers. Milimetre watchdog: At 5000 metres altitude, the 66-dish Atacama Large Millimeter/submillimeter Array (ALMA) is the largest astronomical observatory on Earth. Head-on collision: Optical telescopes reveal giant star clusters and dust clouds in two distorted, colliding galaxies known as the Antennae Galaxies. 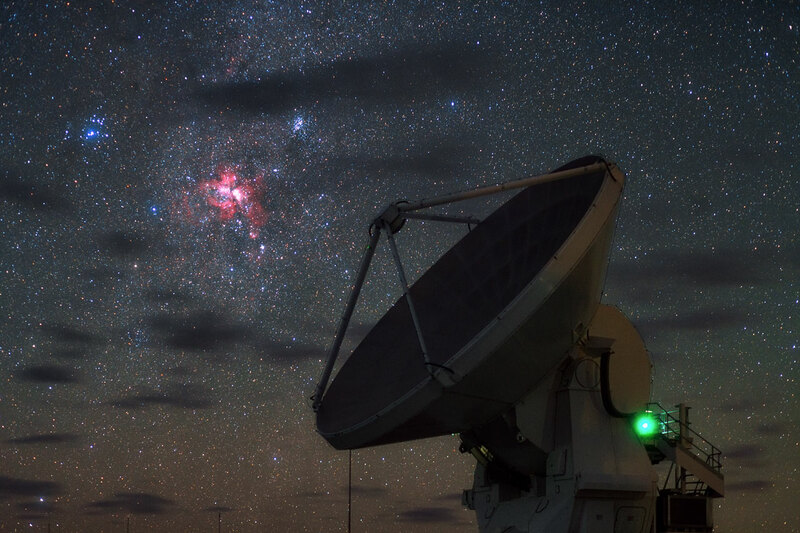 Cold gas: At (sub-)millimetre wavelengths (coded red, pink and yellow), ALMA reveals cold clouds of gas and dust from which even more new stars will form. Radio waves from space were first discovered in 1930. But radio astronomy only flourished in the 1950s, when astronomers discovered that cold hydrogen gas emits weak radio waves at a wavelength of 21 cm. Observing at shorter radio wavelengths required new detector technology. 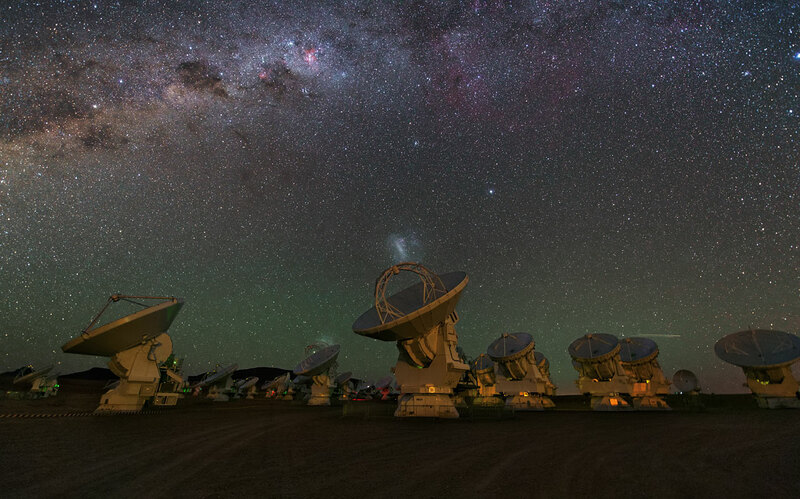 At present, the international ALMA observatory (Atacama Large Millimeter/submillimeter Array) in Chile is the largest collection of radio dishes in the world. Since millimetre waves are absorbed by atmospheric water vapour, ALMA had to be constructed at an altitude of 5000 metres. Baby photo: The European Space Agency’s Planck mission mapped the cosmic background radiation – microwaves from the newborn Universe. There’s no sound in empty space. But cold gas gives off radio waves. Astronomers study them with giant metal dishes. If they were turned into sound, you would hear hisses and crackles.